Only a short walk from Lake Eacham, there is a relaxing 30 minute walk through the rainforest to the Lake Eacham Falls and stream. The road to the Lake divides in two - the left branch leads to Atherton and Yungaburra, but the smaller right branch is unmarked. This smaller road to the right takes you to the Lake Eacham Falls. About one kilometre down the road there is a small bridge, which is near the start of the walking track. A little further, heading away from Lake Eacham, there are small car parking bays on the left and right hand sides of the road. Walking back over the bridge, the walk begins on the left-hand side of the road. 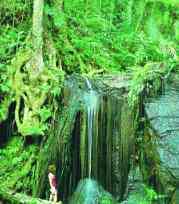 It is only a short walk down to the waterfall, and the walking path follows the route of the creek and forms a circuit, passing under the bridge and then heading back up towards the roadway. As you pass under the bridge, look out for the giant ferns towering above, and throughout the rest of the walk remember to look up at the numerous epiphytes growing on the taller trees, and down to the smaller plants and fungi living on the forest floor.